Goldstriker International has won the questionable first prize in managing to produce the most expensive mobile phone in human history this week, with an iPhone 3G Supreme worth a reported £1.92 million. This would be one of those phones that you would NOT want to be taking out to Soho on a Friday night bender and then, as you always do, dropping under the seat of an unlicensed mini-cab and totally forgetting about it on the way home. The iPhone 3GS Supreme was designed by a scouser, no less - one Stuart Hughes of Liverpool, who spent ten months of his life creating this thing. We'll repeat that, for effect. Ten months of his life. Dipping an iPhone in gold. So how is it worth nearly £2 million? Here is how. 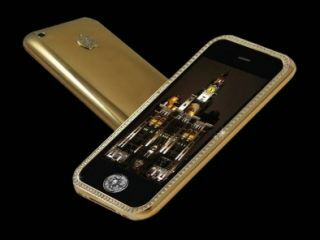 It features 271 grams of 22ct solid gold, while 136 flawless diamonds (68 Ct's worth) on the front bezel, the rear Apple logo in solid gold lined by 53 diamonds and the front navigation button houses a very rare diamond at 7.1cts. Oh, and it also 'ships' with 7kg chest made from a single block of Granite, offset with Kashmir gold and top grain Nubuck leather inner lining. You won't find it on the Apple Store. It was actually commissioned by an 'eccentric' (idiotic) and anonymous Australian gold mining magnate. Or just wait until they go on sale at Tesco next month and pop down to your local Argos to buy some cheap beads to stick on it.